Middlemarch: A Study of Provincial Life is a novel by George Eliot, the pen name of Mary Anne Evans, later Marian Evans. It is her seventh novel, begun in 1869 and then put aside during the final illness of Thornton Lewes, the son of her companion George Henry Lewes. During the following year Eliot resumed work, fusing together several stories into a coherent whole, and during 1871–72 the novel appeared in serial form. The first one-volume edition was published in 1874, and attracted large sales. Subtitled “A Study of Provincial Life”, the novel is set in the fictitious Midlands town of Middlemarch, thought to be based on Coventry, during the period 1830–32. It has multiple plots with a large cast of characters, and in addition to its distinct though interlocking narratives it pursues a number of underlying themes, including the status of women, the nature of marriage, idealism and self-interest, religion and hypocrisy, political reform, and education. The pace is leisurely, the tone is mildly didactic (with an authorial voice that occasionally bursts through the narrative), and the canvas is very broad. Although it has some comical and comically named characters (Mr. Brooke, the “tiny aunt” Miss Noble, Mrs. Dollop), Middlemarch is a work of realism. Through the voices and opinions of different characters we become aware of various issues of the day: the Great Reform Bill, the beginnings of the railways, the death of King George IV and the succession of his brother, the Duke of Clarence (who became King William IV). We learn something of the state of contemporary medical science. We also encounter the deeply reactionary mindset within a settled community facing the prospect of what to many is unwelcome change. The eight “books” which compose the novel are not autonomous entities, but reflect the form of the original serialisation. A short prelude introduces the idea of the latter-day St. Theresa, presaging the character Dorothea; a postscript or “finale” after the eighth book gives the post-novel fates of the main characters. 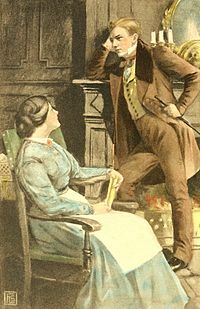 Middlemarch has retained its popularity and status as one of the masterpieces of English fiction, although some reviewers have expressed dissatisfaction at the destiny recorded for Dorothea. In separate centuries, Florence Nightingale and Kate Millett both remarked on the eventual subordination of Dorothea’s own dreams to those of her admirer, Ladislaw. However, in the epilogue George Eliot herself acknowledges the regrettable waste of Dorothea’s potential, blaming social conditions. Virginia Woolf gave the book unstinting praise, describing Middlemarch as “the magnificent book that, with all its imperfections, is one of the few English novels written for grown-up people”. Martin Amis and Julian Barnes have cited it as probably the greatest novel in the English language. On 1 January 1869, George Eliot listed her tasks for the coming year in her journal. The list included “A Novel called Middlemarch”, along with a number of poetry and other projects. Her most recent novel, Felix Holt, had been published more than two years earlier and had not sold well. Despite this, the projected new novel was to be set in the same pre-Reform Bill England as Felix Holt, and would again deal with the reform issue, although less centrally. In its first conception, Middlemarch was a story involving Lydgate, an ambitious doctor, the Vincy family, and Mr. Featherstone. Progress on the novel was slow; by September, only three chapters of the story had been completed. The main reason for this lack of development was the distraction caused by the illness of Lewes’s son Thornie, who was dying slowly of tuberculosis. Following his death on 19 October 1869, all work on the novel stopped. At this point, it is uncertain whether Eliot intended to revive the original project; in November 1870, more than a year later, she began work on an entirely new story, “Miss Brooke”, introducing Dorothea. Exactly when she started to combine this narrative with the earlier Lydgate-Vincy-Featherstone plot is unrecorded, but the process was certainly under way by March 1871. As the scope of the novel grew, a decision was taken as to the form of its publication. In May 1871, Lewes asked publisher John Blackwood to bring the novel out in eight parts, at two-monthly intervals from December 1871. Blackwood agreed, and the eight books duly appeared throughout 1872, the last instalments appearing in successive months, November and December 1872. Dorothea Brooke is an idealistic and well-to-do young woman, engaged in schemes to help the lot of the local poor. She is seemingly set for a comfortable and idle life as the wife of neighbouring landowner Sir James Chettam, but to the dismay of her sister Celia (who later marries Chettam) and her loquacious uncle Mr. Brooke, she marries instead Edward Casaubon, a middle-aged pedantic scholar who, she believes, is engaged on a great work, The Key to All Mythologies. She wishes to find fulfilment by sharing her husband’s intellectual life, but during an unhappy honeymoon in Rome she experiences his coldness towards her ambitions. Slowly she realises that his great project is doomed to failure and her feelings for him descend to pity. She forms a warm friendship with a young cousin of Casaubon’s, Will Ladislaw, but her husband’s antipathy towards him is clear (partly based on his belief that Ladislaw is trying to seduce Dorothea to gain access to Casaubon’s fortune), and Ladislaw is forbidden to visit. In poor health, Casaubon attempts to extract from Dorothea a promise that, should he die, she will “avoid doing what I should deprecate and apply yourself to do what I desire”—meaning either that she should shun Ladislaw, or, as Dorothea believes, that she should complete The Key to All Mythologies in his place. Before Dorothea can give her reply, Casaubon dies. She then learns that he has added the extraordinary provision to his will that, if she should marry Ladislaw, Dorothea will lose her inheritance from Casaubon. Meanwhile, Tertius Lydgate, an idealistic young doctor with advanced ideas for medical reform, has arrived in Middlemarch. His voluntary hospital work brings him into contact with the town’s financier, Mr. Bulstrode, who has philanthropic leanings, but is also a religious zealot with a secret past. Bulstrode’s niece is Rosamond Vincy, the mayor’s daughter and the town’s recognised beauty, and she sets her sights on Lydgate, attracted by what she believes to be his aristocratic connections and his novelty. She wins him, but the disjunction between her self-centredness and his idealism ensures that their marriage is unhappy. Lydgate manages his financial affairs badly and he is soon deep in debt and has to seek help from Bulstrode. He is partly sustained emotionally in his marital and financial woes by his friendship with Camden Farebrother, the generous-spirited and engaging parson from a local parish. At the same time, we have become acquainted with Rosamond’s university-educated, restless, and somewhat irresponsible brother, Fred, who is reluctantly destined for the Church. He is in love with his childhood sweetheart, Mary Garth, a sensible and forthright young woman who will not accept him until he abandons the Church (which she knows he has no interest in) and settles in a more suitable career. Mary unintentionally causes Fred to lose a considerable fortune, which was bequeathed to him by the aged and irascible Mr. Featherstone, then rescinded by a later will which Featherstone, on his death-bed, begs Mary to destroy. Mary refuses to engage in such a legally questionable act. Fred, in trouble over some injudicious horse-dealing, is forced to take out a loan that is co-signed by Mary’s father, Caleb Garth, to meet his commitments. When Fred is unable to pay the loan, Caleb Garth’s finances become compromised since he must pay back the loan himself as co-signer. This humiliation shocks Fred into a reassessment of his life and he resolves to train as a land agent under the forgiving Caleb. These three interwoven narratives, with side-plots such as the disastrous though comedic attempt by Mr. Brooke to enter Parliament as a sponsor of Reform, are the basis of the novel until well into its final third. Then a new thread emerges, with the appearance of John Raffles, who knows about Bulstrode’s past and is determined to exploit this knowledge via blackmail. In his youth, the now fire-and-brimstone church-going Bulstrode engaged in some questionable financial dealings and also owes much of his early fortune to a marriage to a much older, wealthy widow. Bulstrode’s terror of public exposure as a hypocrite leads him to hasten the death of the mortally sick Raffles by giving him access to forbidden alcohol and excessive amounts of opium. But he is too late; Raffles had already spread the word. Bulstrode’s disgrace engulfs the luckless Lydgate, as knowledge of the financier’s loan to the doctor becomes public, and he is assumed to be complicit with Bulstrode. Only Dorothea and Farebrother maintain faith in Lydgate, but Lydgate and Rosamond are threatened by the general opprobrium with the necessity of leaving Middlemarch. The disgraced and reviled Bulstrode’s only consolation is that his wife stands by him as he, too, faces exile. The final thread in the complex weave concerns Ladislaw, who, since their initial meeting, has kept his love for Dorothea to himself. He has remained in Middlemarch, working as a newspaper editor for Mr. Brooke, and has also become a focus for Rosamond’s treacherous attentions. After Brooke’s election campaign collapses, there is nothing to keep Ladislaw in Middlemarch so he visits Dorothea to make his farewell. But Dorothea, released from life with Casaubon but still the prisoner of his will, has come to fall in love with Ladislaw. She had previously seen him as her husband’s unfortunate relative, but the peculiar nature of Casaubon’s will led her to begin to see him in a new light, as well as opening herself and Ladislaw up to public gossip. Renouncing Casaubon’s fortune, she shocks her family again by announcing she will marry Ladislaw. At the same time, Fred, who has proved an apt pupil of Caleb’s profession, finally wins the approval and hand of Mary. The book examines the role of education in the lives of the characters and how such education and study has affected them. Rosamond Vincy’s completion of school education is a foil to Dorothea Brooke’s thirst for purposeful education, which was generally denied women of the era. Rosamond initially admires Lydgate for his exotic education and his intellect. A similar dynamic is present in Dorothea and Casaubon’s relationship, with Dorothea revering her new husband’s intellect and eloquence. Dorothea comes to question Casaubon’s depth and penetration, while Rosamond is too self-obsessed to sympathise with Lydgate’s focus and ambition. Despite extreme erudition, Mr. Casaubon is afraid to publish because he believes that he must write a work that is utterly above criticism. In contrast, Lydgate at times arrogantly drives ahead, alienating his more conservative fellow physicians. He regards the residents of Middlemarch with some disdain, his sympathy tempered by the belief that they are intellectually backward. Despite his education he lacks tact and the politicking skills necessary for advancement in a small town. Most of the central characters of this novel have a habit of building castles in the air and then attempting to live in them. Because they are idealistic, self-absorbed, or otherwise out of touch with reality, they make serious mistakes. These mistakes cause them great unhappiness and eventually their illusions are shattered. Some characters learn from this process and others do not. Those who learn not to build castles in the air generally end up happy, while those who persist in ignoring pragmatism are miserable. Dorothea, who wants nothing more in life than to do good, rejects a young man who would have been a reasonably good match for her to marry the aged scholar Mr. Casaubon. She does this because she likes the idea of being an assistant to him and helping him with his great intellectual pursuits. Unfortunately, she is so much in love with her image of Mr. Casaubon that she fails to notice he is not actually writing anything. He is supposedly working on a great work that, when completed, will link together and explain all world mythologies; however, he is so obsessed with creating a perfect work of scholarship and so afraid of criticism from his peers that he never publishes anything. He is not interested in contributing to the discipline for its own sake; rather, he uses scholarship to enhance his ego and improve his image. Dorothea, in her youth and enthusiasm, does not recognise this. Later, when she meets people who genuinely do love knowledge for its own sake (Ladislaw and Lydgate come to mind), she cannot help but notice the discrepancy between what she wanted and what she actually chose. Yet this discrepancy does not keep her from marrying a second time, to Ladislaw, whom she hardly knows. Based on a few days’ acquaintance developed during her honeymoon and a handful of occasional conversations, Dorothea is attracted to Ladislaw, but does not have an opportunity to get to know him. Their mutual love is developed apart from one another. Lydgate, the other tragic character in this novel, chooses his wife based more on physical attraction than on a knowledge of her character. He marries the materialistic, self-absorbed Rosamond Vincy who, unbeknownst to Lydgate, has been harbouring her own delusions and misconceptions about who Lydgate is. Once safely married, they each find out exactly how poorly they suit one another. He cannot free himself of Rosamond, yet he is unwilling to set aside his (and her) upper-class pretensions to buy himself the time and resources to conduct his medical research. He ignores the basic financial reality of life in Middlemarch, does not dispense prescriptions, and alienates patients by not filling what they believe to be his proper role as a doctor. Eventually he succumbs to Rosamond’s desire to leave Middlemarch and turns into the kind of doctor he never really wanted to be, his research permanently abandoned. He becomes financially successful, which appeases Rosamond. After Lydgate dies, Rosamond marries someone better suited to her tastes, who can indulge her materialism and who never asks her to do anything difficult. Not all the characters in Middlemarch cling to their delusions. Fred Vincy gets a rude awakening when the big inheritance he expects fails to materialise. He sets aside his more frivolous pursuits and goes to work for Mary Garth’s father. Mr. Farebrother, who is also in love with Mary, helps to steer Fred away from temptation and keep him on the best course. Mr. Farebrother does this with a great deal of regret, since if Fred were to fail to become a productive, self-sufficient adult Farebrother himself would have his own opportunity to woo and win Mary, whom he wants for himself. Yet, in the end, Fred is rewarded when he proves himself to be a reliable, sensible individual. Mary accepts his hand in marriage. Rosamond Vincy Lydgate never abandons her delusions about herself and persists in viewing herself as a perpetually wronged princess even though she is scheming and manipulative; yet she does eventually realise that being married to an idealistic doctor is not easy and that marrying into a wealthy family does not guarantee that she and her husband will be rich. She also realises that Lydgate, whom she decided she loved because of his upper-class background and distant origins, is not the meal ticket to which she felt entitled. At the end of the book, after Lydgate’s death, Rosamond correctly identifies the attributes most desirable to her in a husband: a fat wallet and an indulgent nature. She obtains such a husband and lives happily ever after. None of the characters in Middlemarch are intentionally humorous in their diction, although Mary Garth employs great wit. Yet the voice of the narrator comes across as wry and humorous in many places. Unlettered labourers speaking in dialect as minor characters add flashes of humour and poignancy, as in Shakespeare. Dorothea Brooke — An intelligent and wealthy young woman who aspires to do great work. Spurning signs of wealth in the form of jewels or fancy clothes, she embarks upon projects such as redesigning cottages for the tenants of her miserly and embarrassingly neglectful uncle. She can seldom get anyone to take her ideas seriously and she decides to marry the Reverend Edward Casaubon, many decades her senior, to help him with the writing of his great research project, The Key to All Mythologies. The marriage is quickly revealed to be a mistake, as Casaubon does not take her seriously and resents her youth, enthusiasm, and energy. Her requests to assist him merely serve to make it more difficult for him to conceal that his research is years out of date and his work is very lackluster. His research on pagan parallels with Christian theology serves only to entice those who know nothing about the field; those who are familiar with the area of research know that his work is derivative and has been explored thoroughly by earlier researchers. When her husband shunts her aside during their honeymoon, she finds a kindred spirit in the Reverend’s first cousin once removed, Will Ladislaw, and the two become friends. After Casaubon’s death, when their mutual attraction might blossom, it is almost renounced because of various complications, including the provision in Casaubon’s will that, if Dorothea were to marry Ladislaw, she would be disinherited. Such a provision leads people to wonder if Dorothea and Ladislaw had been engaging in anything improper during Dorothea’s marriage, which is a great insult on the part of Casaubon. Eventually, however, they do marry and move to London, but Eliot denies her a straightforwardly happy ending since Dorothea, like Lydgate, fails to reach her potential and sacrifices her dreams to support her husband in his political career. Tertius Lydgate — An idealistic, proud, passionate, and talented-but-naïve young doctor of good birth but small financial means, he hopes to make great advancements in medicine through his research and the charity hospital in Middlemarch. He ends up entangled with Rosamond Vincy and they marry unhappily. His pride and attempts to show that he is not answerable to any man end up backfiring and he eventually leaves town. He quickly falls out of love with his wife and ends up sacrificing all of his high ideals to make a living that will please Rosamond. Rev. Edward Casaubon — A pedantic, selfish clergyman of late middle age who is obsessed with finishing his scholarly research, to the exclusion of other people and things. He marries Dorothea Brooke, leading to a loveless marriage. His unfinished book The Key to All Mythologies is intended as a monument to the tradition of Christian syncretism. However, we later learn that his life’s work is useless as he does not read German and is therefore behind on current studies. We also learn he is aware of this but has put too much time into his research to admit it to anyone else. Mary Garth — The practical, plain, and kind daughter of Caleb and Susan Garth, she works as Mr. Featherstone’s nurse. She and Fred Vincy were childhood sweethearts, but she refuses to allow him to woo her until he shows himself willing and able to live seriously, practically, and sincerely. Mr. Arthur Brooke — The often befuddled and none-too-clever uncle of Dorothea and Celia Brooke. He has a reputation for being the worst landlord in the county, but tries to stand for parliament on a Reform platform. Celia Brooke — Dorothea’s younger sister is also a great beauty, but attractive in a far more sensual way. She does not share Dorothea’s idealism and asceticism, and is only too happy to marry the rejected Sir James Chettam. Sir James Chettam — A neighbouring landowner, Sir James is in love with Dorothea and tries to ingratiate himself to her by helping her with her plans to improve conditions for the tenants. When she marries Casaubon, he marries Celia Brooke instead. Rosamond Vincy — Vain, beautiful, and shallow, Rosamond has a high opinion of her own charms and a low opinion of Middlemarch society. 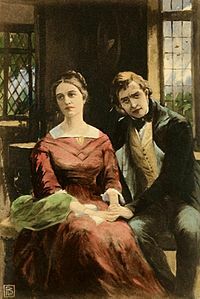 She marries Tertius Lydgate because she believes that he will raise her social standing and keep her comfortable and carefree. When her husband encounters financial difficulties, she thwarts his efforts to economise, seeing such sacrifices as beneath her and insulting to her on the part of her husband. She is unable to bear the idea of losing status in Middlemarch society. Fred Vincy — Rosamond’s brother. He has loved Mary Garth since they were children. His family is hoping that he will find a secure life and advance his class standing by becoming a clergyman, but he knows that Mary will not marry him if he does become one. Brought up with expectations from his uncle Mr. Featherstone, he has a tendency to be spendthrift and irresponsible. He later finds, by studying under Mary’s father, a profession at which he can be successful and which Mary will respect. Will Ladislaw — A young cousin of Mr. Casaubon, he has no property because his grandmother married a poor Polish musician and was disinherited. He is a man of great verve, idealism and talent but of no fixed profession. He comes to love Dorothea, but cannot marry her without her losing Mr. Casaubon’s property. Mr. Humphrey Cadwallader and Mrs. Eleanor Cadwallader — Neighbours of the Brookes. Mr. Cadwallader is a Rector. Mrs. Cadwallader is a pragmatic and talkative woman who comments on local affairs with wry cynicism. She disapproves of Dorothea’s marriage and Mr. Brooke’s parliamentary endeavours. Mr. Walter Vincy and Mrs. Lucy Vincy — A respectable manufacturing family. They wish their children to advance socially, and are disappointed by both Rosamond’s and Fred’s marriages. Mr. Vincy’s sister is married to Nicholas Bulstrode. Mrs. Vincy was an innkeeper’s daughter and her sister was the second wife of Mr. Featherstone. Mr. Caleb Garth — Mary Garth’s father. He is a kind, honest, and generous businessman who is a surveyor and land agent involved in farm management. He is fond of Fred and eventually takes him under his wing. Mr. Camden Farebrother — A poor but clever vicar and amateur naturalist. He is a friend of Lydgate and Fred Vincy, and loves Mary Garth. Nicholas Bulstrode — Wealthy banker married to Mr. Vincy’s sister, Harriet. He is a pious Methodist who tries to impose his beliefs in Middlemarch society; however, he also has a sordid past which he is desperate to hide. His religion, consisting of “broken metaphor and bad logic,” consistently favours his personal desires, but is devoid of sympathy for others. He is an unhappy man who has longed for years to be better than he is, and has clad his selfish passions in severe robes. Mr. Peter Featherstone — Old landlord of Stone Court, a self-made man who married Caleb Garth’s sister and later took Mrs. Vincy’s sister as his second wife when his first wife died. Mr. Hawley — Foul-mouthed businessman and enemy of Bulstrode. Dr. Sprague — Middlemarch doctor. Mr. Tyke — Clergyman favoured by Bulstrode. Rigg Featherstone — Featherstone’s illegitimate son who appears at the reading of Featherstone’s will and is given his fortune instead of Fred. He is also related to John Raffles, who comes into town to visit Rigg but instead reveals Bulstrode’s past. His appearance in the novel is crucial to the plot. John Raffles — Raffles is a braggart and a bully, a humorous scoundrel in the tradition of Sir John Falstaff, and an alcoholic. But unlike Shakespeare’s fat knight, Raffles is a genuinely evil man with a jolly exterior. He holds the key to Bulstrode’s dark past and Lydgate’s future. Bulstrode believes his secret will be safe with Raffles’ demise. Virginia Woolf described Middlemarch as “one of the few English novels written for grown-up people”. In addition, V. S. Pritchett, in The Living Novel, wrote, “No Victorian novel approaches Middlemarch in its width of reference, its intellectual power, or the imperturbable spaciousness of its narrative…I doubt if any Victorian novelist has as much to teach the modern novelists as George Eliot…No writer has ever represented the ambiguities of moral choice so fully”. Critic Jerome Beaty argues that one could read Middlemarch as George Eliot’s Reform novel, although political history is represented only “indirectly”. Popular since its first publication, the novel remains a favourite with readers today. In 2003, the novel was listed at number 27 on the BBC’s survey The Big Read. In January 2007, a book entitled The Top Ten (edited by J. Peder Zane) listed Middlemarch as number ten in its list “The 10 Greatest Books of All Time”, based on the ballots of 125 selected writers. “What do I think of ‘Middlemarch’?” What do I think of glory – except that in a few instances this “mortal has already put on immortality.” George Eliot was one. The mysteries of human nature surpass the “mysteries of redemption,” for the infinite we only suppose, while we see the finite…. Middlemarch has been adapted for television twice and will be the subject of a forthcoming film. 2013: Middlemarch, an Orange Tree Theatre production adapted and directed by Geoffrey Beevers in 3 plays: Dorothea’s Story, The Doctor’s Story, and Fred & Mary. ^ Guppy, Shusha (Winter 2000). “Julian Barnes, The Art of Fiction No. 165”. The Paris Review (157). Retrieved 18 May 2011 . ^ Journal of the History of Medicine (PDF). Oxford Journals. January 1981 . ^ Dolin Tim. George Eliot. Oxford UP, 2005. 99. ^ Grossman, Lev (15 January 2007). “The 10 Greatest Books of All Time”. Time. Retrieved 12 May 2010. Beaty, Jerome (1960). Middlemarch from Notebook to Novel: A Study of George Eliot’s Creative Method. Urbana: University of Illinois Press. Harvey, WJ (1961). The Art of George Eliot. London: Chatto & Windus. Leavis, FR (1948). The Great Tradition: George Eliot, Henry James, Joseph Conrad. London: Chatto & Windus. Beaty, Jerome (December 1957). “History by Indirection: The Era of Reform in “Middlemarch””. Victorian Studies 1 (2): 173–179. ISSN 0042-5222. Chase, Karen. Middlemarch in the Twenty-First Century. Oxford: Oxford University Press, 2006. Middlemarch (PDF, PDB LIT). Girle books . Middlemarch, a study of provincial life 1 (first ed.) , Middlemarch 2 , Middlemarch 3 , Middlemarch 4 . Middlemarch study guide and teacher resources. Shmoop . “Garth, Caleb“. New International Encyclopedia. 1906. This article uses material from the Wikipedia article Middlemarch, which is released under the Creative Commons Attribution-Share-Alike License 3.0.